A simple yet divine tart which celebrates creamy, sharp fetta in a new and interesting way. If you haven’t tried whipped fetta before you will love it! 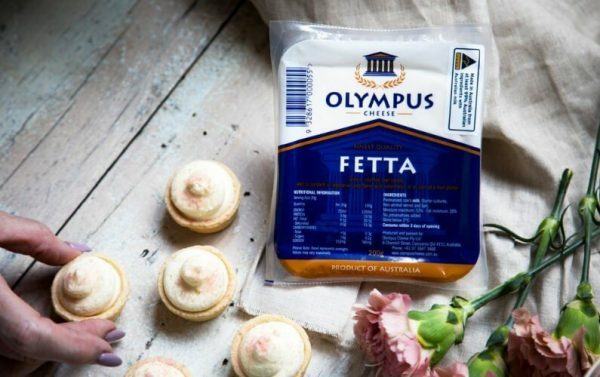 Experiment with either our buffalo fetta, which is earthy and creamy, or our Olympus Fetta, which has a more traditional Greek-style fetta flavour. In this recipe, fetta is delicately paired with a sweet rose petal jam. Rose petal jam can be found in gourmet food stores or a good deli, or you can have a go at making the jam yourself. If you can’t source it, quince jam has similar qualities for a flavourful mix of sweet and savoury. In addition, a strawberry jam could also give that sweet hit, dusting with freeze dried strawberry dust to serve. This tart will be a beautiful and unique addition to your pre-Christmas drinks appetiser menu, or new Year soiree. In a bowl of an electric mixer whisk together the fetta and cream cheese until smooth. Slowly pour in the thickened cream and continue to whisk until smooth and creamy. Place 1 teaspoon of jam in the base of each tart shell. Then pipe whipped cheese mixture on top. Garnish with dried rose petals. Recipe and Styling by Tracy Hirst, Photography Hawke Anderson. Want to know where to find Olympus Fetta Cheese?